The Liaoning CV-16 aircraft carrier and assigned naval aviation units conducted their first live fire training exercises in the Bohai Sea sometime last week. The drills exhibited the J-15 Flying Shark’s ability to carry both PL-12 air-to-air missiles and YJ-83 anti-ship missiles aloft, despite the weight limitations imposed by the ski-jump STOBAR operations inherent in the Liaoning’s design. STOBAR, or Short Take Off-But Arrested Recovery, is a form of aircraft carrier operation that requires an angled ski-jump ramp to aid aircraft in getting airborne on take-off, and uses a series of cables to arrest the aircraft upon landing. The Liaoning also engaged aerial targets with close-in defense systems, and practiced coordinated maneuvers with escorting frigates and destroyers. Two J-15 naval aircraft prepare for launch from the Liaoning CV-16, while a third aircraft stands-by astern of the starboard blast deflector. These live fire drills, with aircraft launched and recovered with live ordinance was a major milestone along China’s rapidly maturing aircraft carrier program. While the Liaoning is far from a game-changer in the naval balance of power in the region, it has been efficiently utilized as a training platform to educate the foundational core of officers, sailors and airmen that will build the future Chinese aircraft carrier force. The second PLAN aircraft carrier, CV-17 is in advanced stages of construction at Dalian Shipbuilding in northeastern China. It will be the first aircraft carrier built entirely in China. The Liaoning was purchased from the Ukraine in the late 1990s and towed to China for an extensive rebuild. The CV-17 as of October 3rd of this year. Major hull and superstructure construction in mostly complete. Photographs and satellite imagery of the CV-17 during construction denote a somewhat larger displacement, greater internal hanger space for aircraft stowage below deck, and a larger island. Located on the starboard side of the flight deck, in similar orientation as that on the Liaoning, the island of the CV-17 is substantially larger. Analysis of the new island structure, which was constructed in two modules before attachment to the vessel due to its size, seems to suggest a more advanced communications equipment suite and updated Type 346A active phased array radar (APAR). The Type 346A radar can be found on the Type 052D destroyers of the PLAN, and is most likely to be fitted on the Type 055 Destroyers currently under construction. By contrast, the Liaoning is equipped with an earlier Type 346 active electronically scanned array (AESA) radar. Photographs of the mock-up island located in Wuhan, which is used for training and orientation of naval crews, support this hypothesis. The aircraft carrier bridge orientation and training mock-up in Wuhan, China is being extensively modified to mirror the new island design of the CV-17 still under construction. Perhaps of greatest importance is the growing evidence that the PLAN has completed construction of land-based aircraft carrier catapult systems at the Huangdicun Airbase, located on the northwestern coast of the Bohai Gulf in the Shenyang Military Region. The PLAN’s only regiment of J-15 carrier aircraft is based at Huangdicun. When not deployed on the Liaoning, the pilots of the regiment practice carrier launches and arrested landings at the airfield. Two ski-jumps and two sets of arrester cable installations were set up at the airfield to help train naval aviators in STOBAR operations before the Liaoning was commissioned. 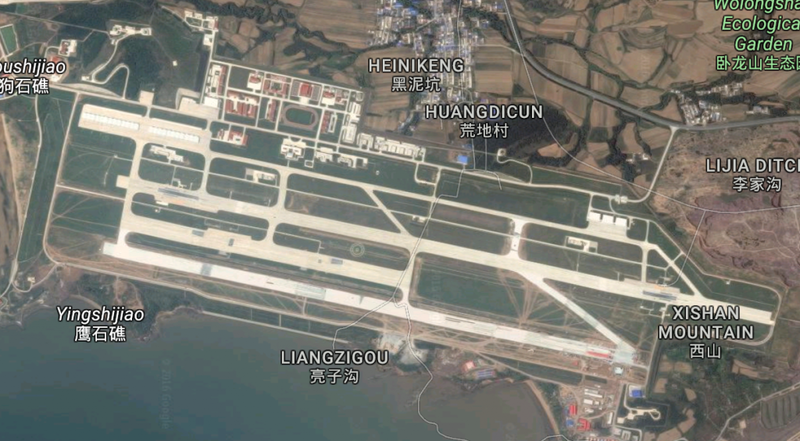 The Huangdicun Airbase. There are two sets of ski-jump ramps and two arrested landing areas. Recent satellite imagery suggests that the airbase now houses two aircraft launching catapults. What is not known, is whether there are two steam-driven catapults, or one steam and one electro-magnetic catapult. Although Chinese claims have been made in state run media that the PLAN is making progress with electro-magnetic catapult technology, these assertions cannot be independently verified. The construction on the northeastern corner of the Huangdicun Airbase suggests two catapult launch systems. Although they appear slightly different from above, it is impossible to confirm if they are of the convention steam driven design, or if one is an electro-magnetic catapult, as suggested by a number of analysts. Satellite imagery of Huangdicun Airbase in its entirety, showing the orientation of ski-ramps, arrestor landing areas, catapults, hangars for J-15 naval strike fighters and support buildings are clearly visible. The launch bar can clearly be seen attached to the nose landing gear of both aircraft. The arrestor hook, used in arrested recovery can also be clearly viewed on both aircraft, though more clearly on the aircraft on the left. It is obvious that Chinese naval aviators will begin practicing CATOBAR operations at Huangdicun Airbase in the immediate future, most likely beginning in the first or second quarter of 2017. 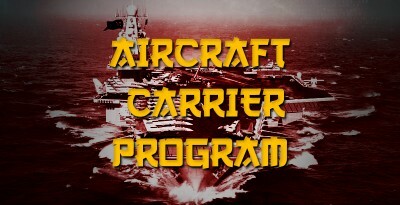 This is a logical step along the way to preparing an air wing skilled in such operations, as well as the necessary handlers, directors, and hook runners required to successfully and safely conduct catapult assisted launches on a modern aircraft carrier. The very fact that this training is being initiated, supports the theory that the third aircraft carrier in line for production will dispense with the ski-jump ramp of the first two, and will adopt either a steam driven or electro-magnetic catapult system. If the future CV-18 is equipped with catapults for aircraft launches, the weight limitations currently hampering PLAN carrier strike aircraft fuel and ordinance load will be rectified. A CATOBAR equipped CV-18 will gain the advantages of greater range and weapons load-out for its strike wing. It will also allow for the use of fixed-wing anti-submarine (ASW) aircraft and tactical airborne early warning (AEW) aircraft. The PLAN’s current reliance on helicopter borne ASW and AEW is a shortcoming that must be resolved. The CV-17 will most likely be commissioned after extensive sea trials in 2018-2019, and reach full operational status by 2020. Currently, only the United States and France operate CATOBAR equipped aircraft carriers. The British Navy is without an aircraft carrier for the first time since 1918. The HMS Queen Elizabeth (R08) is slated to enter service with the Royal Navy in 2017, with the beginning of sea trials scheduled for early that year. The vessel should reach operational status by 2020, with a sister carrier the HMS Prince of Wales (R09) joining her in operational service by 2023. China will be one of only four nations in the world with a CATOBAR capable aircraft carrier if the CV-18s planned CATOBAR arrangement comes to fruition.